Energy storage is one of the most pressing issues facing the renewable energy industry. 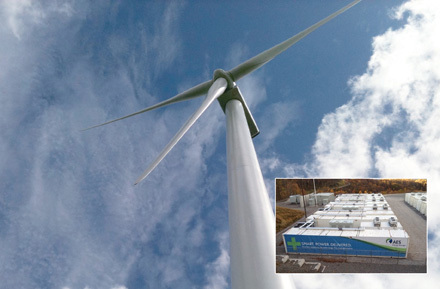 AES Energy Storage recently completed a 32 MW integrated battery-based energy storage project at the 98 MW Laurel Mountain wind project in West Virginia, said to be the largest battery installation attached to the power grid in the continental United States. Being able to storeenergy is one of the most pressing issues facing the alternative energy industry today. By their nature, wind and solar power are intermittent, with power generation possible only when the wind blows or the sun shines. But if someone is able to figure out a practical, affordable way to store power, it would be a tremendous boost to wind and solar. It is often referred to as the "silver bullet" that could propel renewable energy development to a whole other level. Clean energy storage, as it is often called, is getting a fair bit of attention and a good deal of capital. According to a recent Ernst & Young LLP report, U.S. venture capital investment in cleantech companies increased by 73 percent to $1.1 billion in the third quarter of 2011, compared to the year earlier. Of particular note, the energy storage segment led cleantech investment during the third quarter, raising $421 million. This segment raised a total of $865.2 million through the first three quarters of 2011. "We saw significant commitments in energy storage, which reflects a growing corporate focus on proactively managing their energy mix," said Jay Spencer, Ernst & Young LLP Americas' cleantech director. Major power generation companies and utilities are among those investing millions of dollars in energy storage. Washington, D.C.-based AES Corporation, a Fortune 200 global power company, which had revenues of $17 billion in 2010, is among the larger power players looking to move renewable energy storage forward. AES has set up a subsidiary company, AES Energy Storage, to be the owner-operator of storage projects designed to improve the performance and reliability of the power grid, utilizing patented software, dynamic power control, and storage technology. AES Energy Storage essentially deploys and operates projects to help utilities, power markets, and renewable developers level the variability of generation and demand on the grid. Among AES Energy Storage's recent projects was 32 MW of integrated battery-based energy storage at AES Wind's 98 MW Laurel Mountain wind project in West Virginia. The combined wind and storage system there is providing renewable energy to the PJM Interconnection, the largest power market in the world. PJM is responsible for keeping the lights on in all, or part, of 13 U.S. states. According to AES, the Laurel Mountain project is the largest battery installation attached to the power grid in the continental United States. "Energy storage technology is the silver bullet that helps resolve the variability in power demand," said Terry Boston, PJM president and CEO. "Combining wind and solar with storage provides the greatest benefit to grid operations and has the potential to achieve the greatest economic value." Using advanced battery technology, the storage service provided by AES Energy Storage will help optimize the renewable energy generated at Laurel Mountain. The project provides PJM with regulation service, delivering instantaneous response to grid operator requests for power, helping to match generation and demand. The storage also allows the wind facility to control the ramp rate of its generation, smoothing out fluctuations in minute to minute power output. AES Laurel Mountain is among the first wind generators to supply critical operating reserve capacity to help maintain the reliability of the power grid, says AES. "The Laurel Mountain project is a unique application of wind and battery storage technology combining clean energy production with state of the art grid support services," said Phil Herrington, president of Global Wind Generation for AES. "The storage facility is more than double the size of our previous projects, demonstrating our ability to scale up this advanced power resource," added Chris Shelton, president of AES Energy Storage. AES Laurel Mountain consists of 61 GE 1.6 MW wind turbines capable of a combined power generation of 97.6 MW and 32 MW of A123 Systems energy storage devices. The 61 wind turbines are mounted on 80-meter towers deployed along a 13-mile stretch of Laurel Mountain in Ran-dolph and Barbour counties near Elkins, West Virginia. 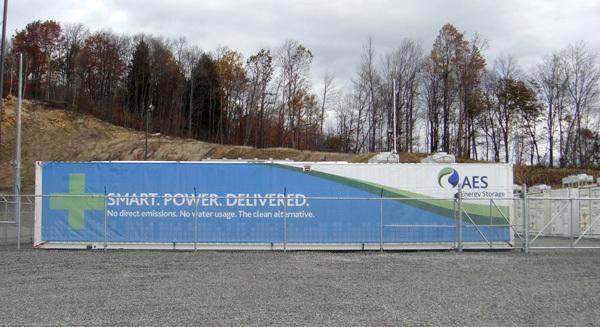 Piers Lewis was project manager for AES Energy Storage on the Laurel Mountain project, and he noted that the company has gradually scaled up its energy storage projects over the last several years. There were projects for California ISO and the Midwest Independent Transmission System Operator Inc. (MISO). "Those were smaller projects, in the 1 to 2 MW range," explains Lewis. "The first larger system we did was 12 MW in Chile, which has been working since late-2009 on the Chilean grid." The Laurel Mountain energy storage facility was built on a one-acre site next to the substation, below an existing transmission line, at an elevation of 2800 feet. Late in 2010, it completed the first 8MW of a planned 20 MW grid-scale battery-based energy storage system in the New York power market. The project is designed to deliver instantaneous response to grid operator requests for power, helping to level the variability of generation and demand on the grid. The Chile and New York projects, however, are standalone, while the Laurel Mountain project ties in with a wind farm and is larger. "We've had experience over the last four years with smaller projects, then gained experience with the grid operations, and then moved up to a larger application for frequency regulation and renewable integration at Laurel Mountain," says Lewis. "We think there is big potential for using this storage technology to provide peaking capacity on power grids, displacing traditional peaking capacity, such as natural gas-powered systems." Delivering power at such peak times can mean significant revenues for a company. While the Laurel Mountain wind storage project is 32 MW, AES Energy Storage is at the point that it can take on much larger projects, in 50 MW modules. The company has proposed a 400 MW battery storage peaking capacity system for the Long Island Power Authority in New York State. "This has been a big year for us," says Lewis. "We have a 32 MW project built and efficiently working at the Laurel Mountain wind project, and now we're at the stage where we can do much larger projects, on a modular basis." That could include combining efforts with additional wind power projects in the future, as well. While Lewis did not use the term "silver bullet" for energy storage, he notes it can play a significant role in renewable energy projects. "Energy storage can play a number of roles in power grids, and renewable energy integration and facilitation of integration of renewable energy into the grid is an important one. So we really jumped at the opportunity to work with our colleagues at AES Wind to combine storage with the Laurel Mountain wind project," said Lewis. "With Renewable Portfolio Standards, there are requirements for more renewable projects to generate energy, and energy system operators will need better control over the variability of wind and solar to integrate them. The fast responding energy storage projects we provide are an excellent tool for system operators to quickly adjust system frequency, keep everything stable, and maintain reliability on the grid." There are several different features of energy storage systems that can help wind power projects, says Lewis. "As variable energy, such as wind, becomes more important, system operators can make good use of energy storage to smooth out the variability—but it also allows you to store wind generation power at night, for example, when there is less demand for power, to use during peak times. The Laurel Mountain wind project provided an opportunity to work on a high profile wind project not too far from the nation's capital (Elkins, West Virginia, is only a three-hour drive from Washington) and to work with a major system operator—PJM. Even though Laurel Mountain is fairly close to some major towns such as Elkins, Lewis noted the project came with its challenges. It is in a remote area and located on top of a mountain ridge, so they had steep inclines on construction roads and not much land to work with at the top of the ridge. The energy storage facility was built on a one-acre site next to the substation, below an existing transmission line, at an elevation of 2800 feet. Energy storage projects are new creatures for most government bodies, so AES Energy Storage provided plenty of information on what they wanted to do in presentations to the various government agencies, such as the Public Service Commission of West Virginia. "It just takes time because it is different," explained Lewis. "A storage project is not your traditional gas-fired power plant or wind turbine project. "They carried out a rigorous review of what we proposed, how it would work and whether there would be any environmental impact. There is no air pollution with the AES system, we don't need any water, and there are no water discharges—it is very benign environmentally." The energy storage system at the Laurel Mountain wind project is made up of a staggering 1.3 million lithium-ion batteries enclosed in about 2,000 battery packs, which in turn are in 16 shipping container-sized units. The fact that the storage systems are low maintenance and do not require any fuel or water, means that they can be located in places where traditional power resources could not go, making them ideal for remote wind and solar projects, he added. Lewis explained that the lithium-ion batteries used at Laurel Mountain were designed for hybrid buses and electric buses—the batteries are in use in buses in New York City and Denver, among other U.S. cities. "They were developed for transportation applications in city environments, so they've been studied from a permitting, environmental, and safety impact aspect for many years." He notes that some hand tools, such as drills, also have the same kind of batteries. "We showed the agencies that this is not the first time these batteries have ever been used—they are used in a number of applications already." As with some of their previous projects, AES Energy Storage used lithium-ion batteries from A123 Systems Inc. at Laurel Mountain. The system there is made up of a staggering 1.3 million batteries enclosed in about 2,000 battery packs, which in turn are in 16 shipping container-sized units. At Laurel Mountain, these thousands of batteries allow AES to adjust power delivery to the grid up and down, making the project less subject to sudden drop offs in power due to changes in the wind. Separate from the wind farm, the battery operation also sells frequency regulation services to grid operator PJM, supplying quick bursts of power to maintain an even balance between power supply and demand on the grid. This, says Lewis, is where most of the revenue for the battery system currently comes from. "We assist PJM in providing stability and reliability, to keep the frequency where it needs to be to help control the grid." This, Lewis says, can be a very demanding task. "The dispatchers at PJM are sending signals to Laurel Mountain every four seconds—the signal might be 'charge at 20 MW'—four seconds later, the signal might be 'discharge at 3 MW.' We can jump around with extremely fast response times, to help system operators smooth the frequency variations on the grid." As an example, the system at Laurel Mountain can go from positive 32 MW to negative 32 MW in less than a second. Related to the wind project, the system essentially helps make the power generated from the 61 wind turbines more useful to the grid. "As the wind comes up and drops off, the battery storage system can respond to smooth out and ramp control the power generated from the wind." That's very useful, considering that within an hour, power generated from wind could go from 98 MW to zero MW at Laurel Mountain. Lewis noted the batteries are fairly low maintenance, and AES has developed these protocols from its other operating storage projects. "We understand maintenance for reliability of a power resource. There are no moving parts, it involves checking the transformer oil, some basic preventative maintenance on switches and other items, and taking care of the storage systems. There is not a lot of additional work and maintenance required in addition to what is already being done on the wind farm itself." The more complicated aspects of the system are in the sophisticated control systems and are hard wired into each operation. AES has developed the control technology, some of which is patented. They develop the algorithms within each system and make any necessary adjustments from their control center in Washington, D.C. The inverter systems, supplied by Parker, also have sophisticated control systems. HMT Inc., the same contractor that did the AES battery storage project in New York State, also did the Laurel Mountain battery project. "We've worked with them on a few projects, and they're familiar with what we do, but there are many contractors that could do these types of projects," says Lewis. "It's a modularized system, so it's easily delivered, and we have layout drawings showing the locations for wiring up and all the electrical characteristics for the contractor to tie the containers to the grid." Not to oversimplify the project, but AES wants the battery projects to be, as much as possible, plug and play. Looking ahead, Lewis and his colleagues at AES Energy Storage see great potential for battery storage on future wind power projects. "It's very exciting for us to be able to facilitate renewable integration with emissions-free capacity to match emissions-free energy generation, such as wind power."